Having heard many good things about Vortex spotting scopes from our readers and Forum members, on Day 1 of SHOT Show we headed over to the Vortex Optics booth. On display was the entire line-up of Vortex Viper and Razor spotting scopes (both HD and non-HD), with objective diameters ranging from 50mm to 85mm. We know that the 85mm Razor HD has been very popular with our readers, as it offers excellent “bang for the buck”. This spotter runs $1599.00 complete with 20-60 power eyepiece. That’s about half the cost of the big name Euro-brand spotting scopes with comparable objectives. Making the Razor HD even more attractive this year is the availability of a new 18X/23X long-eye-relief eyepiece for Vortex’s flagship spotting scope. 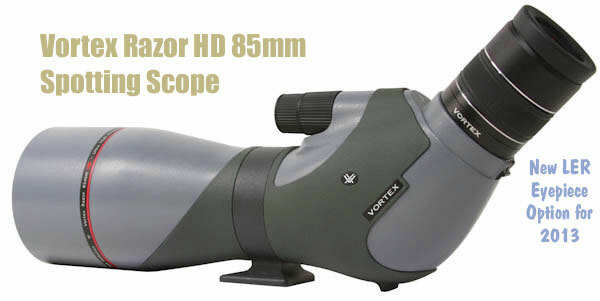 For 2013, Vortex has added much-requested 65mm and 50mm models to its Razor HD line of spotting scopes. This is good news for guys who prefer a lighter, more compact spotting scope, or who don’t need the extra light-gathering power of a big 85mm objective. The 65mm and 50mm Vortex Razor HD models should be available by mid-spring 2013, and they will be priced quite a bit lower than their 85mm big brother shown above. After reviewing Vortex’s spotting scopes, we checked out an all-new, compact first focal plane scope from Vortex that we predict will be very popular with three-gun and tactical shooters. The New Vortex Viper PSD 2.5-10x32mm tactical scope features an FFP design. This enables rapid ranging with the provided reticles at all magnification levels. This scope with be offered with mil-based clicks and EBR-1 milrad reticle, or with MOA-based clicks and a EBR-1 reticle with MOA-based subtensions. 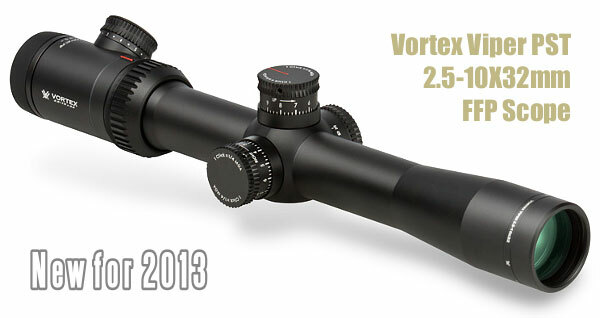 We were also pleased to learn that Vortex will add a 6-24x50mm model to its Viper HS riflescope line. Share the post "Vortex Optics Spotting Scopes and New FFP 2.5-10X for 2013"